If one uses this as a reference to the remarks made by Admiral Allen today he notes that the well is within 200 ft of the initial intersection point, which is about 50 ft below the end of the lined section of the original well, which had been cased with a 9 7/8 inch liner. Below that level the well contains the production casing that was inserted into the well, but which was only cemented into place at the lower end. (The Admiral calls this the drill pipe – which is not the right term to use and which can be a bit confusing if you don’t look at the construction of the well). So let me just try and recreate a rough sketch of the area we are talking about. 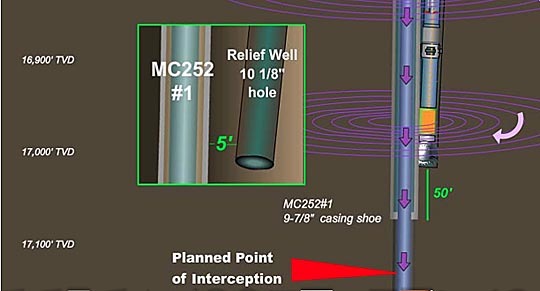 According to the Congressional testimony the bottom of the lined section of the original well ends at 17,168 ft, which is perhaps 100 ft below the level shown by Mr Wells. This is where the original well was lined with a steel casing, with concrete around and below it, as the original well was drilled. The gap between the steel of the casing and the rock is known as the annulus, and it is this that I show filled with cement in two places. So if you look at the above sketch of a section through the hole at the end of the 9 7/8th inch segment, the lighter steel casing liner was installed first, then the cement was pushed down to the then bottom of the hole. The cement flowed out and back up the hole giving the sort of “L” shape that the top cement segment has in this section. The hole was thus lined with a cement and steel jacket, before the drill bit on the end of the drill pipe came down and drilled through the cement at the bottom of that section, and on down to the producing formation. At this point BP could have continued a liner section for the bottom of the well, as they had just done for the segment of the well above, or they could install what is known as production casing. This latter is a long tube that will run from the bottom of the well up to the BOP. They chose to do the latter. Thus the production casing was lowered into place, and the casing section that I show runs the full length of the underground segment of the borehole. However in installing that continuous tube, instead of filling the gap between the rock and the tube (the annulus) with cement all the way up to the cement above it, they only partially filled the gap, over the lower segment of the well. This left a gap of somewhat indeterminate length where there is no cement between the production casing (the Admiral’s drill pipe) and the rock wall. With that situation in mind, let me return to the Admiral’s press conference today. In it he said that the relief well is still around 15 ft from the original well and with about 200 ft to go to the point of intersection. At this point the well is being drilled in 10 – 15 ft lengths and then surveyed, so that the RW can hit the original well where intended. they'll go through a series of spaces, starting with what they call the annulus, and that's the area in the wellbore outside the casing, and then the casing is outside the well pipe. In other words they will come into the well around the zone that I have shown with no cement in the annulus. 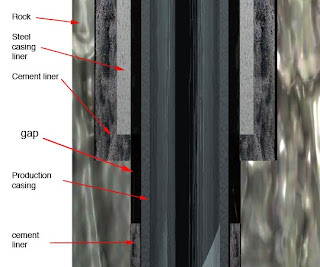 If the well is flowing oil and gas into the space outside of the production casing, then it will be flowing up the outside until it reaches the bottom of the lined section of the well. The flow then moves into the gap between the production casing and the steel casing liner and works its way up to the BOP through that channel. 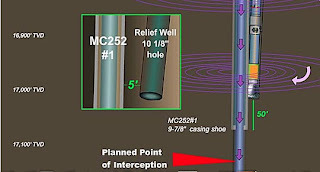 If that is the case, then the bottom of the production casing may be still sealed, and by just filling the channel from the point of intersection up to the BOP with mud, then the well might be killed. On the other hand, if the bottom seal at the lower end of the production casing has failed (which might be why the initial negative pressure test showed flow) then oil and gas are flowing up the inside of the production casing, and filling the space outside the production casing with mud won’t stop the flow. . . .if they have to pump mud up through the annulus and then go into the pipe and pump mud there, too, that's a period of seven, 10 days to accomplish both of those things. And if they have to be done in sequence because of the condition of the wellbore when they go in, it will probably take into August, . . .
For the first 12 hours on July 7 (midnight to noon), approximately 8,330 barrels of oil were collected and approximately 3,925 barrels of oil and 28.8 million cubic feet of natural gas were flared. • and approx. 57.5 million cubic feet of natural gas were flared. And incidentally it appears that the debate on changing the cap is still going on. We are still reviewing the technical specifications that were provided to us by BP on not only that cap, but several other options. The procedures on how it would be done, the amount of time at which the well would be open for discharge of some amount of oil, and the weather window that it would take to do that, and that is all under review right now inside the administration, and I wouldn't want to attach a percentage right now.